Last year I participated in a monthly blog series called The Changing Seasons. The series was initiated by fellow blogger Cardinal Guzman from Oslo and involved people from all over the world posting photographs from their home town or city each month. This year the series is being run again but with another option – to post a single painting, recipe, digital manipulation or photo that represents the month. I’m going for the new version as I like the idea of reflecting on what the month meant to me – a kind of visual diary. For me January in Melbourne is all about being outdoors and enjoying long hot days with family and friends. Schools are closed for most of the month so many families take off to the beach, go camping or relax at home or at their local swimming pool. Inner city streets buzz with locals and tourists eating and drinking at tables outside restaurants and bars, or in pub beer gardens. There are also many festivals and celebrations throughout the month including the Lunar New Year and Australia Day. Each year on 26 January, thousands of people flock to Melbourne Docklands to celebrate Australia Day and watch the fireworks. Many others celebrate the day with a barbecue or party at home with friends. 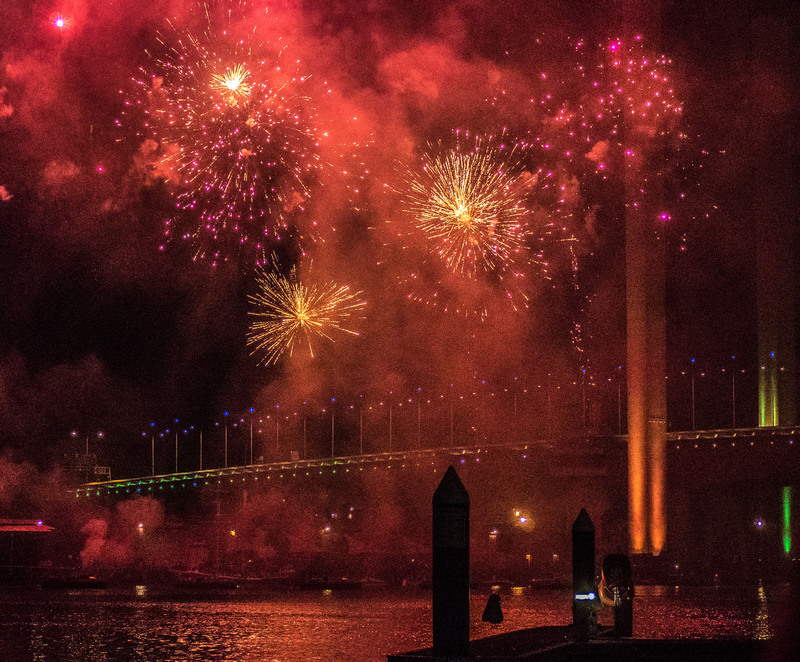 This year I managed to do both – enjoying a leisurely lunch with friends before heading to the Docklands to see this spectacular fireworks display. You summed up Melbourne in January very well. Summer in full swing, and the atmosphere is laid-back as quite a few of us adults are still on holidays after the Christmas break. I really like wandering around Melbourne this time of the year because it’s warm, and there is so much going on in the streets and city. Thanks Mabel. I’m glad you could relate to my description of January in Melbourne. This was the first time I’d photographed fireworks so it was a bit hit and miss. This is so totally opposite of Oslo. The only ones you’ll see outside bars/restaurants are the smokers -luckily there’s a smoking ban so that they have to go outside. Nicely done with the fireworks photo and the descriptive text is spot on! Can’t wait to see how you describe February with all of your amazing travels!